Low fat and sugar. Source of fibre. Suitable for vegetarians. For half the packet use one tablet and follow directions, using half quantities of water.Soaking Instructions1. Dissolve soaking tablets in 850ml (1 1/2 pints) of boiling water and pour onto peas.2. Stir and leave to soak for 12-16 hours, then drain and rinse.3. Cook using the hob or microwave instructions.Microwave ovens vary the speed at which they heat food, so for best results you may need to adjust the cooking time/power setting. 1. 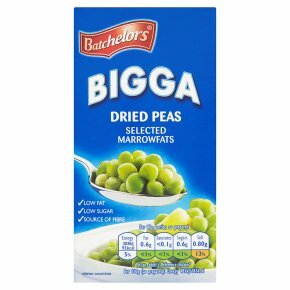 Place soaked peas into a saucepan and add 600ml (approx. 1 pint) of boiling water.2. Add sugar and salt to taste.3. Boil gently for about 20 minutes, stirring occasionally, until the water has been absorbed or the texture is satisfactory. (Based on 650W-850W oven).1. Place the soaked peas into a large bowl suitable for microwave cooking.2. Stir in 600ml (approx. 1 pint) boiling water.3. Add sugar and salt to taste.4. Cook uncovered on High for about 5 minutes or until the peas begin to boil and rise up the bowl.5. Stir, then continue to cook on Med-Low for about 20 minutes, stirring occasionally, until peas are tender and most of the water has been absorbed.6. Leave to stand for 2-3 minutes before serving.